Having recently relocated to the area, the homeowner purchased this house in hopes to gain a sanctuary in her retirement years and to be nearer to her grown children and grandkids. However, a month after moving in the homeowner saw evidence of a water leak. Nearly 6 months later the source of the damage was determined as pin hole leaks in the copper piping, and by then the kitchen and laundry room were declared a total loss. 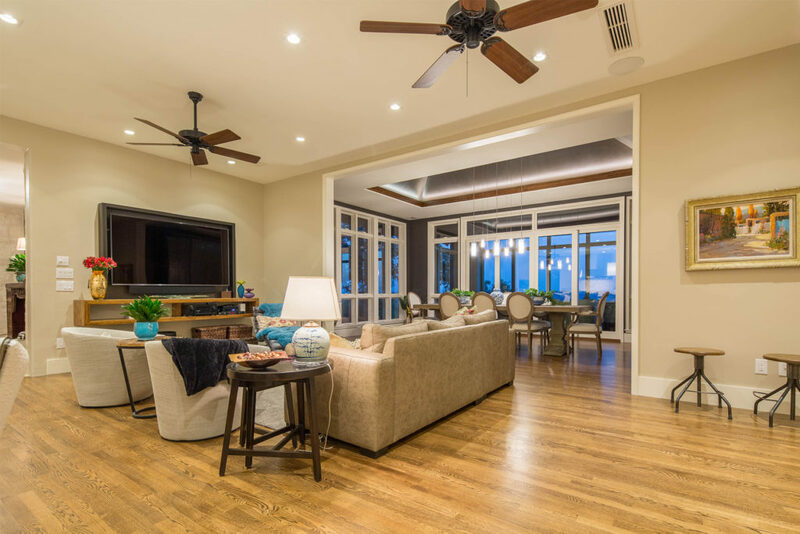 Knowing that she wanted to upgrade and expand the home at some point, the homeowner decided to go “all-in” for a whole house renovation and addition project. Her desires were to add an upstairs area to include a third bedroom with en suite bath and a sewing room. She also wanted a new grand master closet, an exercise room, a formal dining space and a screened porch. The remodel aspects would include designing a new kitchen to include a bar area and large island with lots of seating. The existing guest room and bath would also have to be re-designed to accommodate the new stairwell, and a larger laundry room with plenty of storage and specialty items for her 3 small dogs. 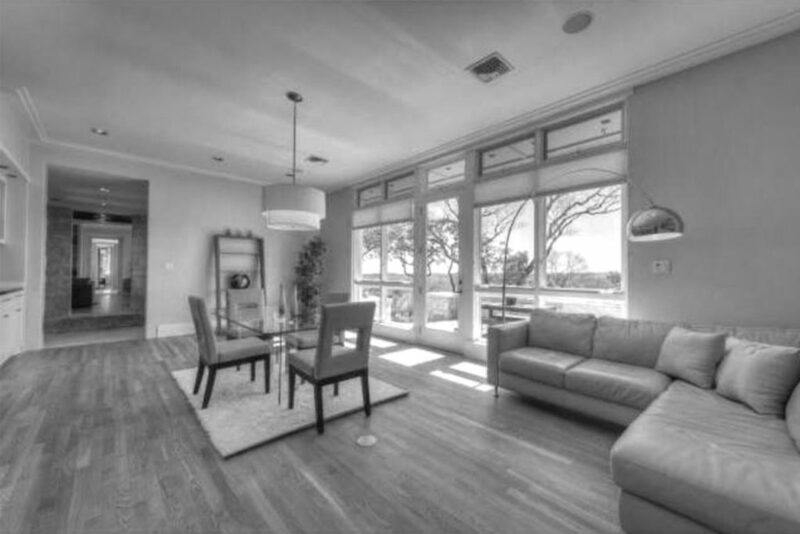 Ample natural lighting in every room was high on the owner’s list of priorities. 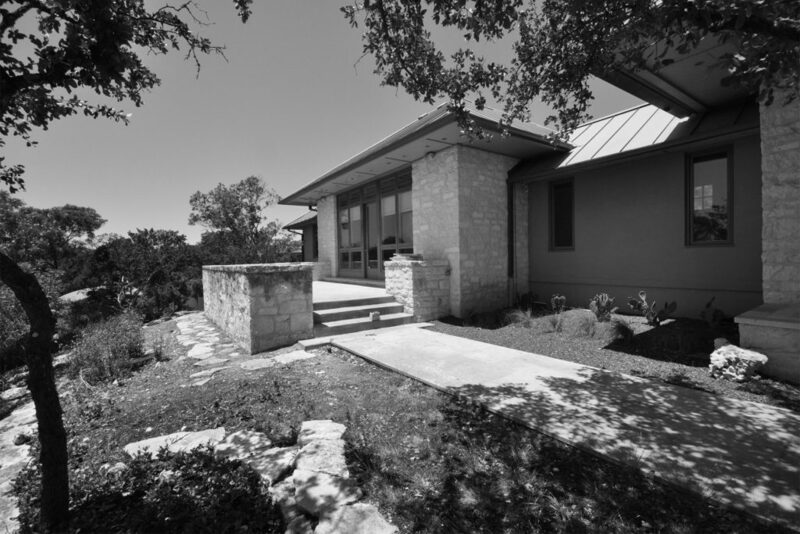 Additionally, since the property sits at a high elevation, full-view windows would provide an expansive 360 degree view of the hill country. Luxurious and timeless finishes, high end cabinetry, a suite of professional grade appliances, and a stunning lighting plan were also paramount to the overall design. Foremost, our team’s goal was to make the new additions and the remodeled areas look cohesive with the existing house. We needed to keep to both the vernacular of the house and the owner’s personal style, which would be one of the hurdles to overcome as the new construction and remodeled areas merged with the existing structure. The fenestration and hardware were meticulously matched and aligned with the existing so as to not interrupt the interior or exterior elevations. Furthermore, there is no trace of where existing openings were filled in or additions were added. The new spaces are now seamless in their design and integration. 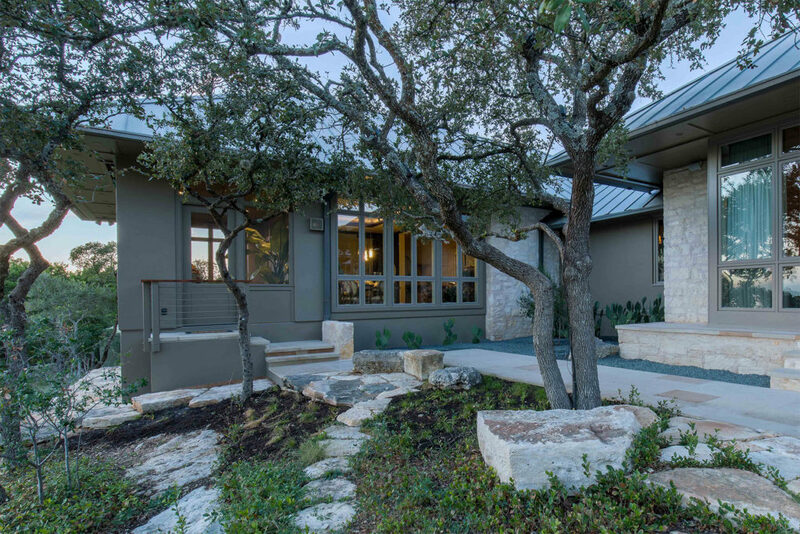 Like many projects in the Austin area, we were constrained by impervious cover overlays for the property and struggled to balance the clients’ desires for additional space with the allowable square footages. This property presented some unique challenges, but our team was able to overcome those obstacles by removing the stone exterior on 2 elevations (which were 6″ thick) and replacing it with stucco. Furthermore, since the addition would put the house over 3,600 sq.ft., fire codes dictated that we provide an automatic fire sprinkler system for the added square footage while maintaining the residential character of the design. Much effort was put into concealing the system and providing the water storage and pump system in a remote building. All the mechanical, plumbing and electrical systems were upgraded or replaced to enhance the project. Variable speed air conditioning units and air handlers were utilized to provide comfort year round and eliminate interior humidity that can be an issue on hyper insulated building envelopes such as this one. The additions utilized spray foam insulation at the roof decks creating conditioned space of the attic, thus reducing the required tonnage of mechanical systems and corresponding utility consumption. Rain water collection is extensive on this project providing for the majority of landscape sprinkler requirements. The new upstairs quarters on the northwest side of the house includes a unique split staircase that leads to the new guest suite on one side and a multi-purpose room on the opposite side that the owner can use for her sewing and craft space or as additional sleeping quarters. To comply with the owner’s request for more natural light our team ingeniously designed a light trough above the tub in the en suite bathroom to camouflage the solar tube and indirect LED light channel for which the tub area is illuminated. Since this is the only room in the house without an exterior wall our team had to devise a way to get natural light into the space. The transom window above the pocket door that separates the vanity area from the wet area allows the natural light to further transmit into the bathroom. In the new stair well, solar tubes were used once again to enhance the natural light quotient in this interior space, but in this application our team custom designed a suspended panel using left over pieces of the expensive Lustrolite material used in the downstairs bath to create an architectural feature as well as a unique indirect light source. The light from the solar tubes now washes the walls with light during the day, while LED recessed fixtures give the same affect at night. The downstairs bath has unique features of its own. Notably, a concealed schluter linear drain system was installed to create an uninterrupted and invisible transition into the shower. The drain is located on the exterior window wall, but due to the meticulous efforts and keen skills of our tile installers it is completely undetectable. The glistening glacier blue Lustrolite panels and large format Porcelanosa tiles provide a seamless and easy-to-maintain surface while further enhancing the visual openness of the room. Finally, the Robern Up-Lift mirror was fitted into the wall to not only provide extra receptacles for grooming items, a fog-less mirror and night-lite features, but to allow adjustability in the height of the mirror for the owner’s 6’5″ son-in-law. Both bathroom spaces include universal design features such as grab bars and adjustable shower heads, pull out grooming units, slip resistant flooring and pull-out steps stools for the children or smaller statured guests. The original kitchen and dining were open but still not conducive to entertaining or family gathering. Now the kitchen, which boasts Brookhaven by Wood-Mode fine custom cabinetry in multiple finishes and textures, is an exquisite space, designed to be used just as efficiently by either a single cook or a slew of catering chefs. “Specific” storage is placed keenly throughout the kitchen to emphasize “zoned” cooking, prep and clean up areas. The new bar area can be used to serve beverages for a cocktail party just as easily as it can serve coffee or breakfast items in the morning. The island seats 7 diners comfortably and bridges the space between the kitchen and the (now) informal living room, creating a much better flow and connection between the nucleus of the home. In the living room, the media unit was custom designed and built specifically to fit the owner’s new TV and components. The unit was made in our own shop using parallel strand board and steel tubing. It’s an unorthodox use of materials but works well in this application both functionally and aesthetically. In fact, the homeowner was so impressed with the design and materials we used that she asked us to create a bar height table for the other side of the room! The formal dining room addition is nestled comfortably between the informal living room and the screened porch addition. The dimensions of the room and tray ceiling were designed to mimic the size and slopes of the existing formal living space on the opposite side of house in order to further the cohesiveness of the new versus the old portions of the home. However, the dining room ceiling is enhanced with the addition of a light trough housing LED tape lighting and a custom designed multi-pendant fixture. Benjamin Moore’s sultry “Silhouette” paint color evokes a luxurious feel to the room while the windows on opposing sides grant views to the lavish grounds and hill country panorama. Likewise, the new screen porch permits a real connection to the breath-taking vistas and garden paths beyond. Another example of the attention to detail is that one will notice the screened “windows” are the same shape and proportions as the rest of the windows around the home; further blurring the lines between old and new, interior and exterior. On the south side of the house is the existing master suite. In adherence to the owner’s wishes, our team designed a 300 sq. ft. master closet. Though currently a widow, the client asked that the closet be designed as a “his-and-hers” space, but still wanted the space to be tailored to her current storage needs. The basic layout looks like an “E” where the center section bumps out into the room like a peninsula, effectively dividing the space, yet is accessible on both sides. Notable features are a multipurpose countertop area, cabinet bar pulls that were ingeniously repurposed for looping scarves and a mirrored vanity area complete with (2) 4′ tall custom jewelry pullouts. We also repurposed the client’s Asian carved wood screen into barn-style doors to camouflage the new master closet entrance. The new exercise room sits adjacent to the new closet via a small gallery hallway. The gallery provides a place for the owner to display her exotic findings from her travels and allowed us a clean transition from old to new construction. We matched the existing wood floors from the bedroom but ran them in the opposite (90 degree angle) direction so the there would be no obvious “feathering” of the wood floor. The exercise room is fitted with raw cork tiles that we also stained to match the color of the wood flooring. Surrounded by windows on three sides, the owner now looks upon, and has immediate access, to her meditation garden and concrete outdoor bath tub. A wonderful way to begin or end a day! In short, the total square footage added was 1,477 square feet. The house now has more of a vintage-eclectic feel to it as we mixed modern lines with classic shapes and materials to create a funky-yet-timeless look. All the materials and products are durable, well-made, and designed to last. Even the natural materials will wear and patina uniformly with the home to retain a renaissance look. The final product reflects the owner’s personal style, tastes and specific needs, and she is ecstatic with the results. In conclusion, this immense, comprehensive addition/remodel project was a one-of-a-kind experience. The owner, though decisive in her requests, allowed our team to do what it does best, and that is to deliver a product with meticulous craftsmanship and attention to detail that actualizes the client’s vision both aesthetically and functionally. Our team designed, executed and delivered the sanctuary the client had originally envisioned.